We wanted to be able to quickly air up bike tires and occasionally also the van’s tires. We installed an air compressor and tank. The tank can also be used to power air-ride suspension seats. We’ve been contemplating buying those ever since we ended up without the van we ordered, which would have had the factory suspension seats installed. 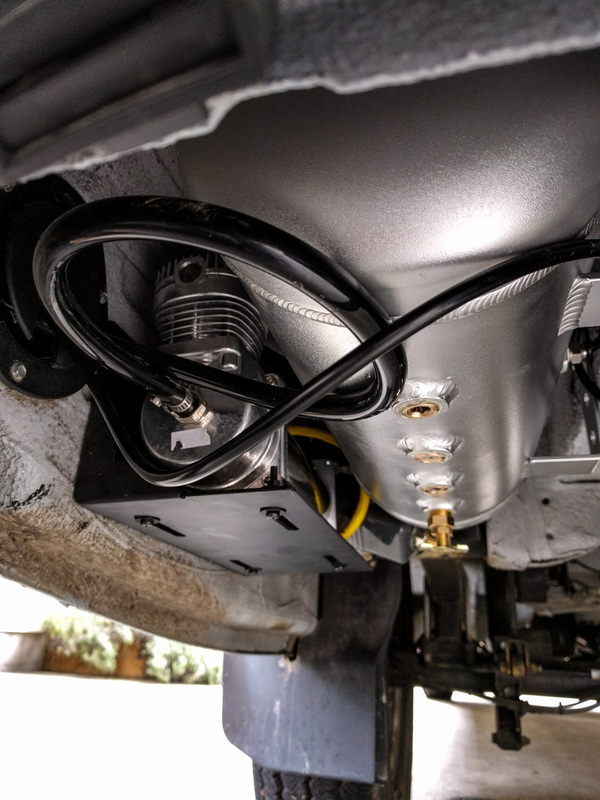 The Viair air compressor sits under the back of the van, and provides pressure for the 3 gallon tank right next to it. We mounted the compressor on the rocker panel with a 90 degree bracket and mounted the tank on the main frame rail. Originally we were just going to use the Viair kit with a 2.5 gallon tank, but that tank won’t fit easily in the available space under the back of the van. The wiring for the compressor runs inside the rocker panel from under the van, through a cable gland to the inside of the rear wall. From there it goes via a switch on the wall by the back door, and on to the breaker panel where it has its own 30 Amp breaker. We had to figure out which of the tank outlets to use for each of the components. 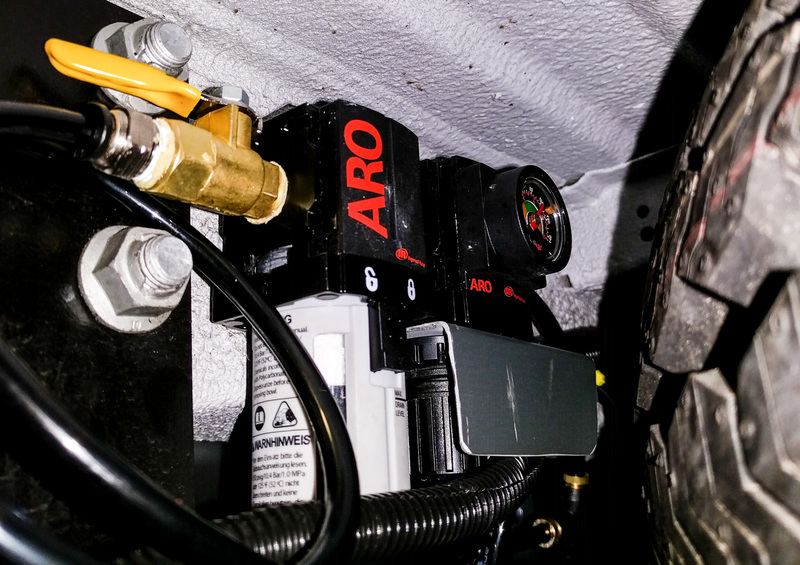 There’s a drain valve, pressure-based on/off relay, the inlet from the compressor, and the outlet to the quick-connect socket that the inflator plugs in to. We used 90 degree elbows on a couple of the fittings just to keep everything compact in the snug space that was available. The 1/8″ diameter air hoses took a bit more work. Two had to run up to an area inside the back doors. One is at tank pressure with a gauge on the end. The other is at the regulated pressure and goes to a quick-connect socket so we can air the bike tires up easily. 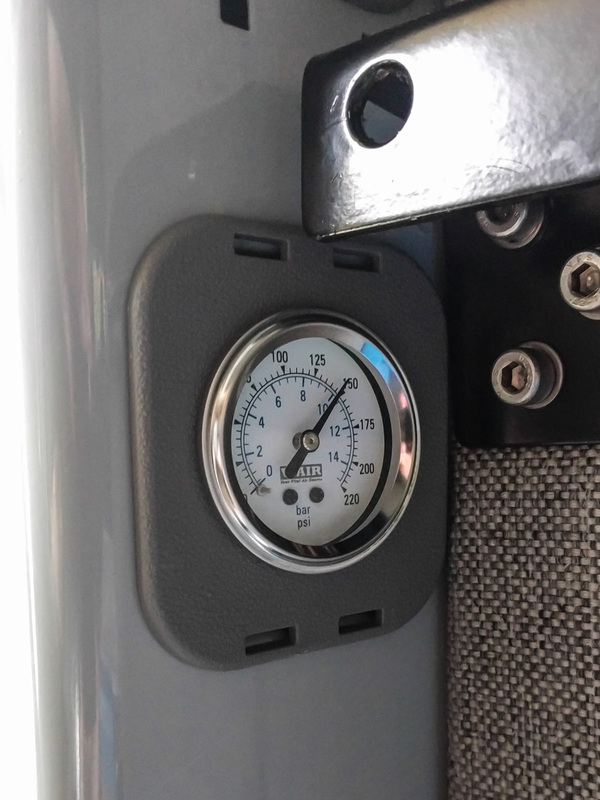 We squeezed those hoses up inside the D pillar and attached the gauge and quick connect through a couple of the plastic plugs that cover the holes in the pillar. The other hose had to run to the front of the van. We followed the line of the wire harness along the chassis rail from back to front, mainly because if it is good enough for Mercedes, it’s good enough for us, but also because that gave us free attachment points to zip tie the hose on to. The hose enters the cabin under the driver’s seat. There was a little rubber grommet there that we removed, enlarged the hole slightly, and installed a bulkhead union with a built-in ball valve. That makes it easier to make changes or remove the air seats in the future without depressurizing the whole system. We used push-to-connect fittings throughout the system. You can get 1/4″ NPT connectors, Ts, crosses, and all sorts of other interesting varieties. They make it much easier to attach and remove the hose than if you use the older style compression fittings, just so long as you insert the hose properly to start with. Because we were already running air hose to the driver and passenger seat bases, it made sense to attach a second quick-connect fitting to the passenger seat base. We used 1/4″ bulkhead passthrough fittings to hold the quick-connect sockets at the front and the rear in place. We’re not going to drill a hole in the seat base for the front quick-disconnect until we know whether we’ll be using these seat bases or buying shorter ones for our new seats and swivels. We needed to add a pressure regulator and filter in the line. The tank is pressurized to 200 PSI, which is much too much for a bike tire. The adjustable pressure regulator we bought can take that down to a more sensible 120 PSI for road tires or lower still if we want it to. The pressure regulator and filter need to be accessible, but not too visible to casual observers and not too likely to get snapped off by stuff we drive over on the trail. They ended up on the opposite side of the frame rail from the tank, protected by the spare tire. The air inlet filter is up inside the D pillar near the rear quick-disconnect. It should stay dry and dust-free there, and we can just about get to it to replace the filter element. The compressor itself is IP67 rated, but we’re thinking of making a cover for the whole area just to protect everything from road grime and rock chips. Update: We found out the air filter was only rated to 150 PSI and the tank is at 200 PSI, so we took it out of the system. Thanks again for your pics, love hearing about the constant frittering with the van. 2 questions about the rear air line. Was it fairly straightforward to thread the air hose through from the bottom? (Or was there some drilling and/or swearing and bloody knuckles involved). I’ve looked briefly at it, but didn’t see a clear channel to run it. Second question- Is there enough flow to seat tubeless MTB tire beads? (My primary use for the air, that and blowing the Tahoe dust that seems to cover the bikes after 5 years of drought here). Getting my compressor installed next week. 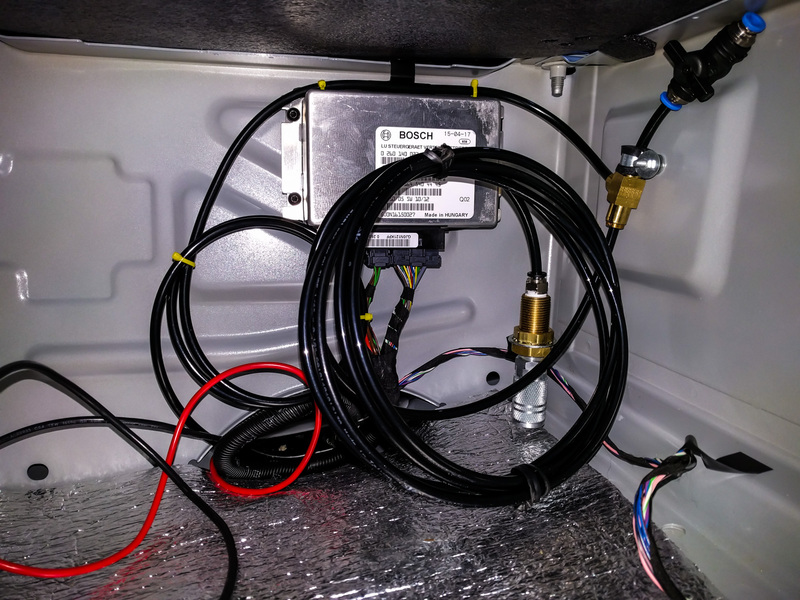 Van Compass has been working on prototypes for a bracket to mount a Viair compressor and 2-gallon tank under the hood where the aux battery goes. I get to be their Guinea pig/test case. The air hose was a real pain to thread through from the bottom. Actually, the 1/4″ supply hoses were fine, but the larger (1/2″?) air filter line was more of a problem. All three went in eventually. Three hoses, because I ran the air filter up into the D pillar where the air is cleaner, then I ran the tank gauge (full pressure) and a quick-connect outlet (regulated pressure) up to some of the plastic covers in the D pillar. Bloody knuckles and swearing were involved, but no drilling was necessary. The hole to thread them through is inside the rocker panel. You have to remove the plastic stopper in the ~3″ hole near the back of the rocker on the inside wall beneath the van. Then, you can thread the hoses through that, and in to a rectangular hole that connects to the inside of the D pillar. I ran a wire fish down from inside the D pillar to help thread the hoses through. I also covered them in something protective (don’t remember what) at the point where they go through the rectangular hole. I’m running ~100 PSI in the regulated hoses. The 1/4″ hose surprisingly flows plenty of air to seat tubeless 29er tires. I’ve found that the trick is to remove the tire’s valve core for the first inflation, then replace the valve core and re-inflate. That’s the same for my shop compressor too, though. The issue is with the valve core flowing enough air, not the line to the valve. I’m interested to see how the bracket looks under the hood. If you’re mounting it there, I’d suggest just running an outlet either to the passenger seat plinth or to the step area, rather than necessarily all the way to the back of the van. The only benefit of the outlet at the rear doors is that we leave the air hose for the tire inflator attached more frequently than we would if it was inside the living area. Happy to hear the 1/4″ line runs through easily. Definitely running an air chuck to a seat pedestal or step as well. Hopefully I will be able to fit an air dryer and regulator under the hood as well. Will see once it’s mounted up. 100psi should be plenty for all my needs. Not going to be running any of my air tools with it. J.T., the plastic plug in the D pillar came with the van. If you have a cargo van, they might not come standard but I’m sure you can pick them up either from a dealer or from a junk yard. Hi, I needed a compressor for my sprinter 170 2500 to air up the van and bike tires when needed. Was initially going to have it built in but opted for a lazier / cheaper solution by buying the portable ARB CKMA12 High-volume compressor. Now that I have it, I am trying to figure out where I can connect the clips to. I believe the sprinter battery is in front of the driver seat under the floor, so the obvious place is to do it there – but not very convenient. I don’t think there is a remote terminal under the hood or elsewhere? I also have 300+ah of house batteries and a couple of 12V outlets, but those are only 20amps and this thing draws up to 30+amps. Hi George, you have several options. The easiest temporary solution for clipping this compressor on to terminals is to use the jump start terminal under the hood. It’s relatively easy to reach, and you can clip the negative terminal of the compressor on to any metal part of the engine block. There’s also the EK1 terminal under the driver’s seat if you want a slightly more permanent mounting point, but it’s only supposed to draw 25A, so you’d be overloading it a little. Even though your 12v outlets are 20 Amps, your house batteries can obviously sustain a higher current draw, so you could always clip the compressor wires directly to the house battery terminals. Not the best long-term solution, but good for one-off use. If you wanted a longer-term solution you could replace the clips on the compressor wires with Anderson PowerPole connectors and plug them in to a (fused) line from either your house battery or even your starter battery. Several alternatives, depending on which battery you want to connect to and how often you think you’ll be doing it. Very nice setup! Question- did you purchase the compressor mount or fab it? The compressor mount is a VIAIR part (#95900). We bought it from Amazon. It’s worked really well so far. Sturdy enough for our needs, for sure.